Limited Time Special Purchase! This pack is a great opportunity to obtain unique runs of tested compatible System 96 sheet glass, in an ever-changing combination of standard quality colors, mixes, and occasional experimental solid colors. A random assortment of ten 6" x 12" sheets of Fusers' Reserve unique color runs. The exact configuration of colors and mixes will differ with each pack. All packs will provide a creative range of new, ever-changing color combinations, mixes, and perhaps the occasional experimental solid color. 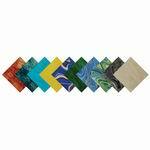 All packs will provide a creative range of new possibilities for every level of glass fusing.